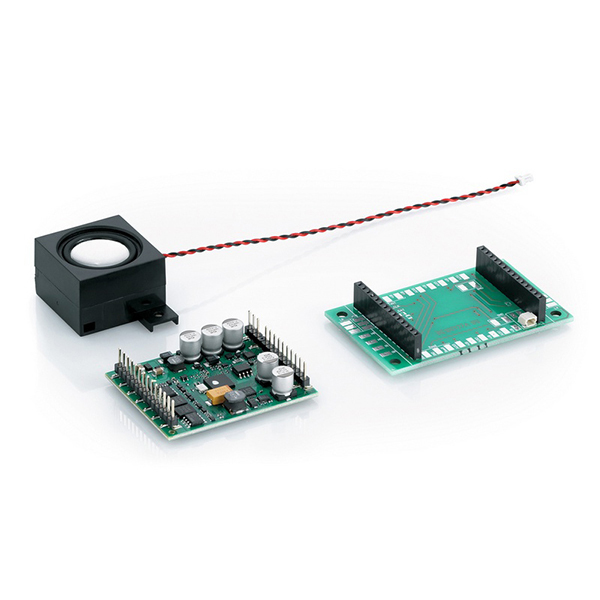 Product: This decoder can be used for digital operation (DCC, mfx) as well as in analog operation (DC). All LGB locomotives and powered rail cars produced starting in 2014 with the 28-pin interface can thereby be converted. Many units with the old 10-pin interface can be converted using the 55529 interface adapter. Units without an interface can be converted using the interface circuit board included with this decoder. Size of the interface circuit board approximately 65 x 40 mm / 2-1/2" x 1-9/16". A speaker box is also included, but other speakers with compatible electrical values can also be connected. Compared to the previous decoder the performance data have been clearly increased and furthermore this decoder offers considerably more functions and programming options. The decoder can be programmed easily with the Märklin Decoder Tool (https://www.maerklin.de/de/service/downloads/neu-nachruest-decoder-mld3msd3/mdecodertool-mdt3/) and can be adapted to individual requirements. Using the Internet, the option exists for access to the extensive sound library that has been expanded specially by a large number of well-known LGB models and that is constantly being expanded. Technical Data: - Total load max. 10 amps, motor output > 4 amps - Audio performance (sound) 6.7 watts / 4 Ohms - Locomotive address can be programmed 1-10239 - 14 or 28 (128) speed levels - Load control can be adapted to analog and digital on different types of locomotives - Parallel control for all light and function outputs - Programmable blinking light and short term functions These and other functions can be programmed with the Märklin CS 2 and CS 3 central units as well as the Märklin Mobile Station. Max. 10 amps total current. Volume of the sounds can be set individually. Calibration function for adapting motors.